VKH Live - J-Rock Quick Maths! | VKH Press – J-Rock & Visual Kei Coverage Worldwide! Home / Media / Slider / VKH Live / VKH Live - J-Rock Quick Maths! VKH Live - J-Rock Quick Maths! We've covered a lot of crazy topics on VKH Live, some serious and some epic. But it's time to take a break and have some fun. We've noticed that a lot of J-Rock bands are inspired by each other, and we thought we might have some fun with that. 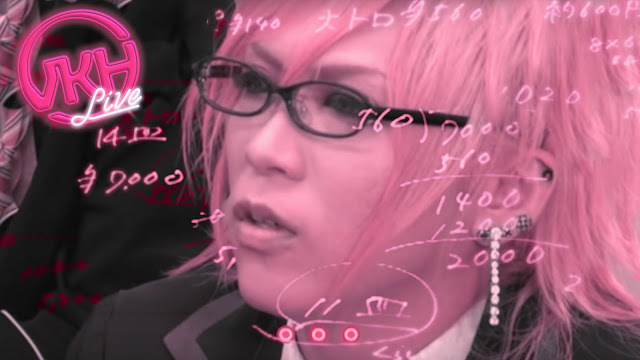 So tonight we're going to be having some fun "Quick Maths" style: we're writing out equations that we think represent our favorite J-Rock bands! (If you're not familiar with the joke we're getting this from, Google "Quick Maths" or "Big Shaq".) Join us tonight at 1:30 AM EST/10:30 PM PST and have some lighthearted fun with us! Click the video below to see when the stream will start in your time zone! A small homework assignment for tonight's stream: come up with your own J-Rock Quick Maths! It's basically just a silly (sometimes snarky) fake math equation that represents a J-Rock band or genre. For example, one of Jeff's equations is "(Lolita23q + ViViD)^2 = POIDOL". Essentially any sort of goofy equation that fits that rough format will work. Share your J-Rock Quick Maths in the chat tonight, and we'll read it on air!